Home/Posts/Long-term disadvantage, part two: How do Pipworth Primary and Sheffield Park Academy do so well for their disadvantaged pupils? This is part two in a series of blogposts exploring long-term disadvantage. Other posts in the series can be found here. The first post in this series showed how the attainment and progress of pupils varied according to how often they had been FSM-eligible – with pupils who are FSM-eligible on almost every occasion (90% or more of their time in school) having the largest ‘gap’ when compared with children who have never been FSM-eligible and, relative to other pupils, falling further behind in recent years. In most schools, pupils like this have progress (value added scores) that are well below the average. There are, though, some schools (158 at KS4; 879 at KS2) where value added for the long-term disadvantaged group is above the national average, as detailed in part one. Before looking at two of these schools, let’s look briefly at another factor – ethnicity. The chart below shows how KS4 attainment varies by amount of time spent eligible for free school meals – expressed as a percentage of the total number of school terms since starting their schooling – with results broken down by ethnicity. The line for all pupils is the data shown in part one. But looking at minority ethnic and white British pupils separately reveals large differences. 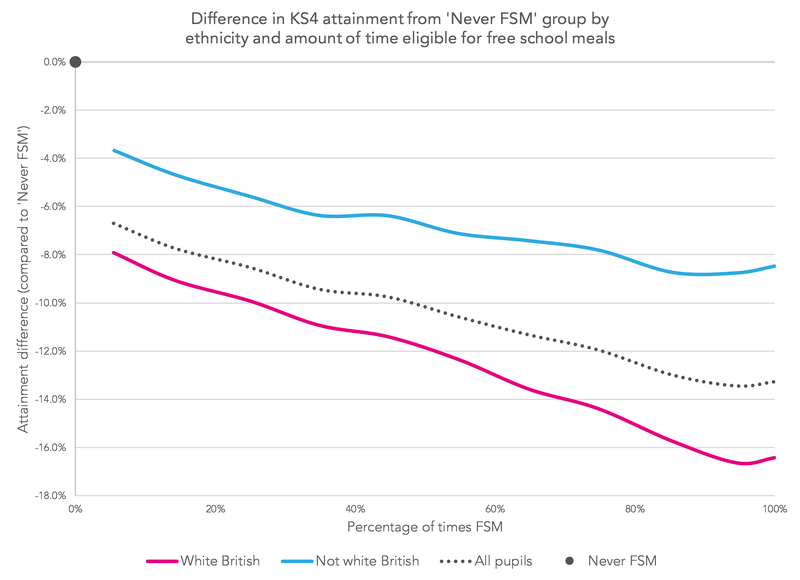 The impact of having been FSM-eligible is larger for white British pupils and, critically, increases as the time spent FSM-eligible goes up at twice the rate which it does for minority ethnic pupils. We’ll explore this more in a future post when we look at the impact of first language. It’s clear, though, that, when comparing schools, we need to take into account differences in the ethnicity/English as an additional language balance of their cohorts. For this reason, for the rest of this post we’re going to focus on the attainment and progress of white British, disadvantaged pupils. Another area where we need to be careful when comparing schools is to look at the actual attainment and progress of different groups of pupils rather than just look at gaps. 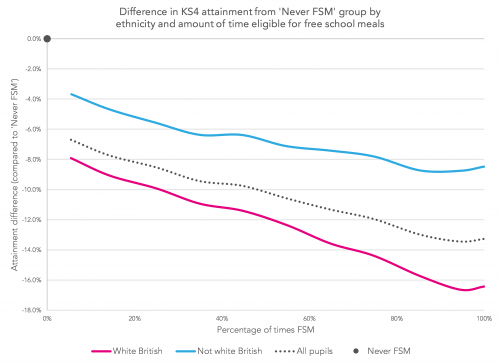 The chart below uses Progress 8 data from 1,691 secondary schools where, in 2016, there were 30 or more white British pupils who had been FSM-eligible at least once since starting their schooling. 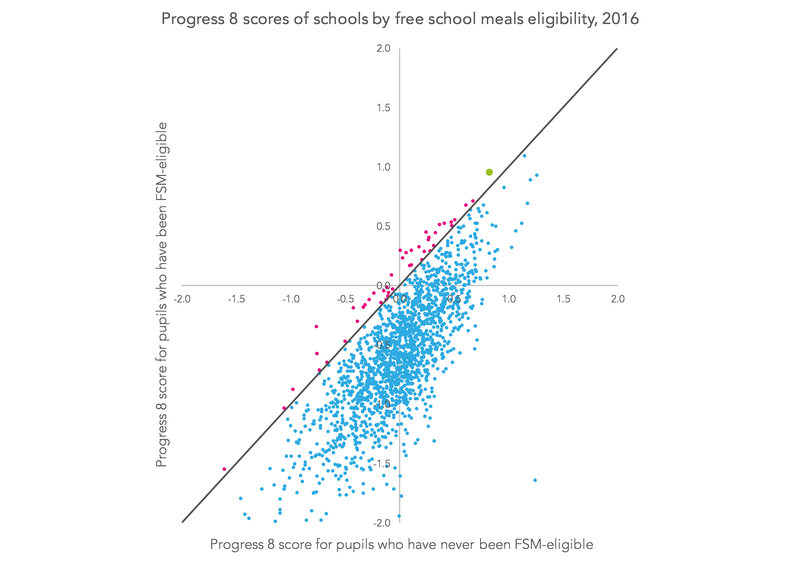 In this chart the horizontal axis shows the Progress 8 score for pupils who have ever been FSM-eligible in a school, and the vertical axis shows the Progress 8 score for pupils (in the same school) who have never been FSM-eligible (the group who, in the first post, we named Never FSM). The dark grey line is where schools would be if the Progress 8 scores of both groups were exactly equal. 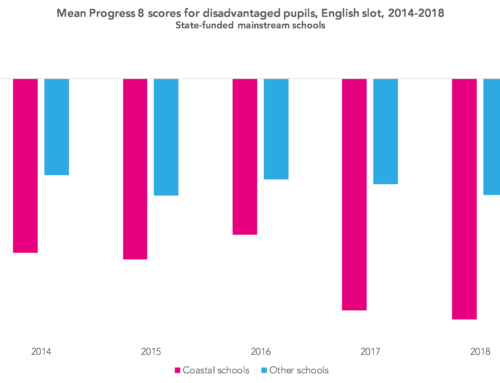 Schools above the line are those where pupils who have ever been FSM-eligible are making better progress than other pupils – something that has to happen nationally if we are to close the gap. 45 schools are above the line. 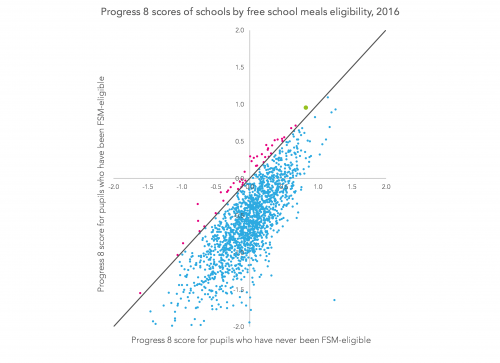 That is, pupils who have ever been FSM-eligible on average have higher Progress 8 scores than other pupils. However of these 45 schools, 22 have below average Progress 8 scores for both pupils who have ever been FSM-eligible and Never FSM pupils. Of the 23 schools where this isn’t the case, the one with the highest Progress 8 scores (shown in green) is Sheffield Park Academy. Find the full list of 23 schools here. So how has this been achieved, and has Sheffield Park Academy always done as well as this? 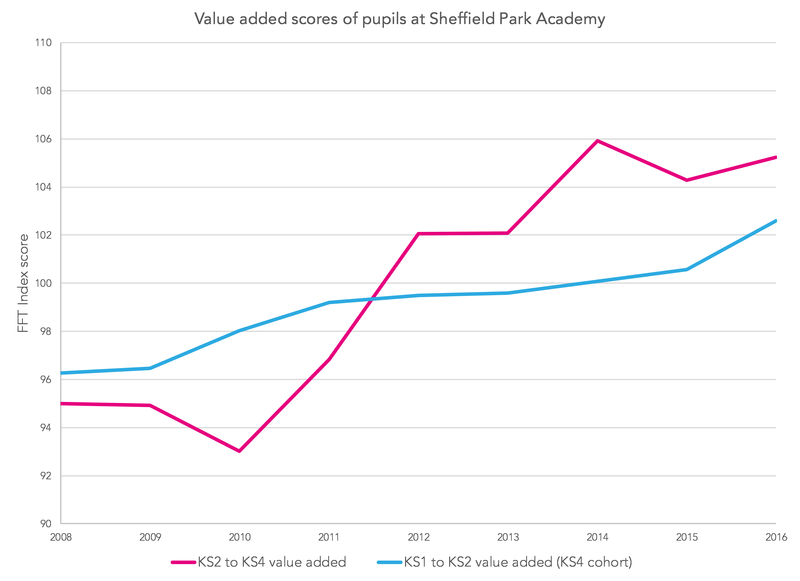 If we look at the second question first, the chart below shows the school’s KS4 progress (value added) scores over time, and also shows the KS2 value added scores for the same pupils (when they would have been receiving their education elsewhere, at primary school). In both cases, figures are reported against children’s KS4 year – so the figures reported against 2016 are for children who (typically) completed KS1 in 2007, KS2 in 2011 and KS4 in 2016. The data in this chart is based on average GCSE grade at KS4 and average Level (Scaled Score in 2016) at KS2. We have used the FFT Index methodology [PDF] so that data over different years can be compared in a consistent manner. 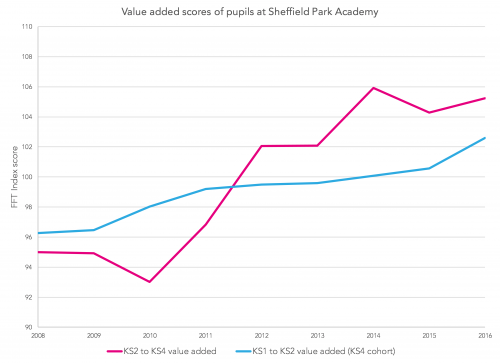 In each year the national value added scores are 100 for each Key Stage – so progress has been improving both at KS2 and at KS4 for Sheffield Park pupils. This chart suggests that a look at KS2 might be worthwhile also. 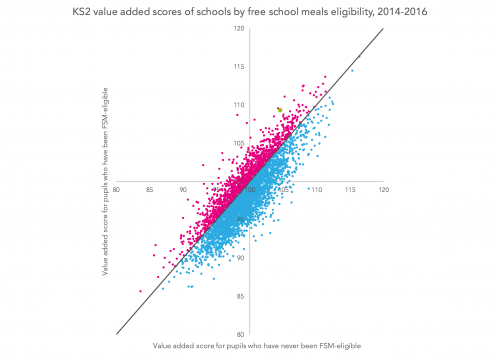 The next chart, similar to the second chart in this post, shows the KS2 value added scores for pupils who have ever been FSM-eligible and for Never FSM, white British pupils in schools. Here data for three years (2014, 2015 and 2016) is combined, due to the smaller pupil counts at primary schools. The school highlighted here (the green dot) is Pipworth Primary. A majority of pupils from Pipworth go on to Sheffield Park Academy. So, in terms of a key underperforming group nationally (disadvantaged, white British pupils) we have two schools serving the same community who are both doing exceptionally well with this pupil group. Back to our first question, then: how have they achieved this? 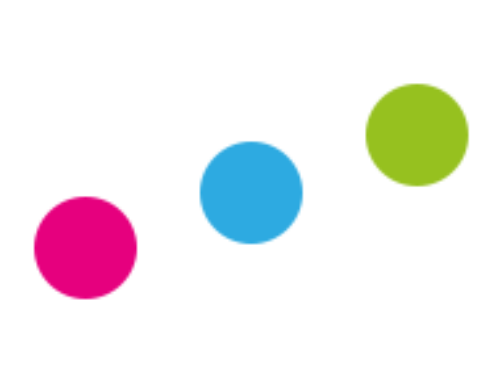 If you want to find out then please read the detailed case studies written by Craig Dillon at Sheffield Park [PDF] and Julie Storey at Pipworth Community Primary School [PDF]! given the current profile of mental health issues it is interesting to note that both schools have specific in-house provision in this context. Finally, let’s ask the $64,000 question – what would happen if all schools did as well as these two with disadvantaged pupils? Well, calculations for KS4 suggest that the national improvement in the percentage of disadvantaged pupils getting a grade C or above in English and mathematics would be around 28%. More on this and other trends in part three. Now read the next post in the series. This is a really interesting analysis. I’d be interested to see what happens to your conclusions if you factor in Special Educational Needs. While those with SEN are over-represented in the FSM cohort, it’s also the case that 2/3 of those with SEN do not qualify for FSM. The other consideration with SEN is that it can lead to negative social mobility – e.g. a child with SEN from a middle class family does poorly at school, is unable to secure employment as an adult and therefore moves down the social mobility “ladder”. Had a quick look at SEN for KS4 outcomes. 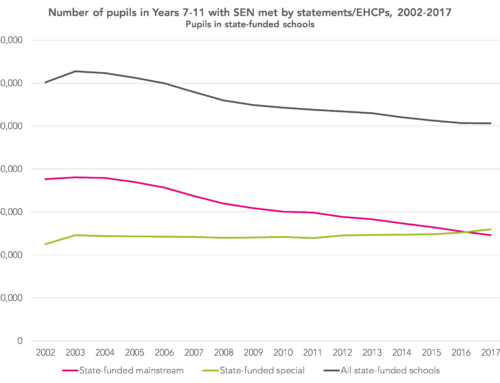 As you say, pupils with SEN are over-represented in FSM cohort – and the % of SEN increases as % of times FSM increases. 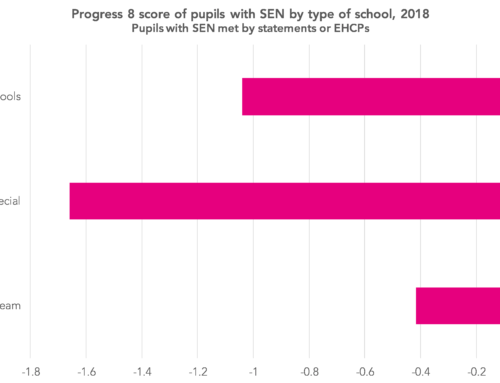 Might be important, though, to look at SEN status of pupils when at end of KS2 rather than at end of KS4 – might investigate this as part of some further work. 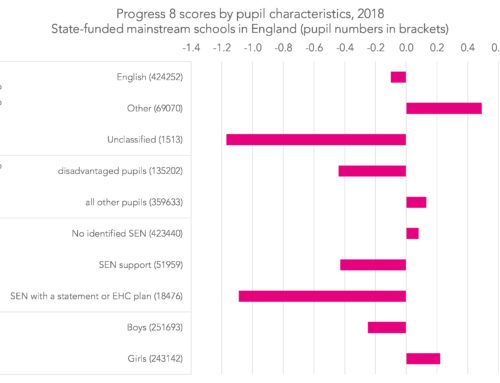 If I look only at pupils who are not SEN then the outcomes at KS4 are very similar with long-term disadvantaged group falling further behind national average. Also, looks like impact of % times FSM is fairly consistent across SEN groups i.e. if we compare pupils with same SEN status then % of times FSM has similar impact.